The latest release from the boutique music label Michael Storrs Music is this new disc of songs by Strauss, Nielsen and Børresen sung by the Danish bass-baritone, Johan Reuter. Recently seen at Covent Garden in The Minotaur and Elektra, Reuter is fast making a name for himself in the opera world as a singer of extraordinary versatility, singing both Wagner's Wotan and Verdi's Posa; he returns to the Royal Opera in the future in Strauss' Salome. This disc opens with Strauss' Acht Gedichte aus 'Letzte Blätter', Op. 10. Reuter's rendition of 'Zueignung' is reassuringly strong, though perhaps the torment and love-sickness is lacking. 'Nichts' is brilliantly sung, however, with a real warmth and jollity in the voice. Restraint carries the singer through the eerie tranquillity of 'Die Nacht', though the increasing vocal power through the line 'Rücke näher, Seel' an Seele' adds piquancy, while both Reuter and his accompanist, Tove Lønskov, respond with feeling to the major/minor contrasts in 'Die Georgine'. The rhetoric of the text in 'Geduld' guides the singer through the vocal line, with meaningful little pauses and gestures placed carefully along the way, and Reuter seems to relish the quirkiness of 'Die Verschwiegenen'. The two very different stanzas of 'Die Zeitlose' elicit admirably contrasting responses from the singer, too, while a splendidly-crafted 'Allerseelen' completes the set. Next up are four songs by Carl August Nielsen, Strauss' Danish contemporary. Not quite the equal of the German master's finest, they nevertheless make in interesting addition to the programme. Reuter sings them in an early German translation by Wilhelm Henzen, as first published in Leipzig. Curiously, the version of 'Im Garten des Serails' published in the liner notes is not quite what Reuter sings, but nevertheless he brings out the heady perfume mentioned in the text. 'Und wenn der Tag' is a slightly bland piece, though Reuter lavishes his interpretative talents on it, but 'Seid'ner Schuh über Leisten von Gold' and 'Irmelein Rose' both feature an imaginative manipulation of the vocal and piano parts, as well as vivid word-painting; Reuter lets rip and shows off his national repertoire at its best. Still, the shift to Strauss' five Op.21 Lieder is a reminder of who the more refined composer was. Reuter lightens his tone for 'All mein Gedanken', flitting around the text with ease, while the comparative imagery in 'Du meines Herzens Kronelein' allows him to create different colours for different lines in the poetry. I think 'Ach, Lieb, ich muss nun scheiden' could be despatched with more world-weariness, and somehow I don't find Reuter entirely comfortable with 'Die Frauen sind oft fromm und still', but 'Ach weh mir' is brilliant material for Reuter's fruity bass-baritone and comic timing. It's back to Danish repertoire with four Lieder, Op. 8, by Hakon Børresen (1876-1954). For me, Reuter pushes too much in the middle of 'Den Lenz lasst kommen', but his emphatic delivery is somehow irresistible; again, there are issues in these pieces with the German versions of the songs printed in the text being different to what is actually being sung. 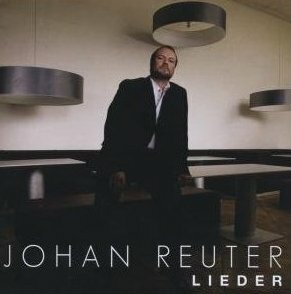 Reuter also sounds slightly below his vocal form in 'Landschaft', but finds his lustre once more in Børresen's setting of 'Im Garten des Serails' and excels in 'Marine', even if the final note is slightly clipped. Back to Strauss for the final collection – his sublime Vier Lieder, Op. 27. Reuter creates an astounding range of sounds in 'Ruhe, meine Seele' and is truly engaging in the way he draws out the textual subtleties. Aside from a hint of strain in the last little ascent, 'Cäcilie' is no less breathtaking, while Lønskov's rippling accompaniment enhances 'Heimliche Aufforderung', the least interesting of Reuter's four interpretations here. 'Morgen!' closes the disc beautifully, with a reverent catch creeping into Reuter's voice and a glistening quality to the piano playing combining to create a still, spellbinding atmosphere. It has to be said that there are numerous Strauss Lieder discs already available from most of the major labels, with Hyperion currently undertaking to record them all, and in some cases the competition wins the day (often because the voice type suits them better). However, there is some remarkable, visceral, compelling singing on this CD, and the combination of Strauss and his Danish contemporaries makes it a far more interesting prospect than the average Strauss disc. Available at a reasonable price, this is recommended listening.